Taking the superior genetics of the original, we have combined Kalashnikov and Ruderalis to create an autoflowering strain that maintains the superior high of its parent, whilst going from seed to harvest in only 9-10 weeks. Be ready for a one hit wonder! AK-47 is a cannabis classic and became widely popular because she is said to be a "one hit wonder". This means, you take one toke and already are super high. This sought-after strain is still a staple where you can buy weed legally and for good reason. The original is a cross of Columbian, Mexican, Thai and Afghani with a hard punch and very good yields that has won numerous awards over time. Now, this incredible strain is available as an automatic version. 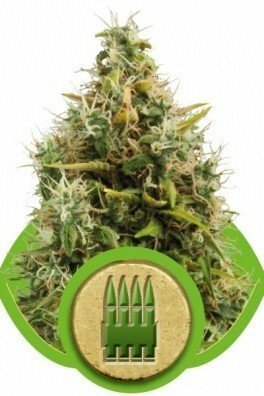 Royal Queen Seeds are one of the breeders that crossed AK-47 with their best autoflowering genetics to create a cultivar that is as good as the original but faster. Yes, that's the only real difference: AK-47 Auto is easier to grow and has a shortened life cycle. The aroma is musky and sweet, like incense. Taste-wise, AK-47 Auto has a somehow spicy yet sweet flavour. Be sure to use fresh carbon filters because this strain is intensely odorous! Expect a strong but smooth and happy high from the trichome-laden buds of AK-47 Auto. You will feel active and uplifted but at the same time experience a soft body-stone. The effect is super potent yet balanced, just like the original. Ak-47 Auto can be grown almost everywhere - be it indoors, outdoors or in the greenhouse. This strain doesn't fail to deliver great results. After 3-4 weeks of vegetative growth, she starts to bloom and is ready for harvest after 9-10 weeks thanks to her autoflowering genes. The plant will develop big and dense flowers that are beautifully frosted with sparkling resin. Indoors, the strain grows to a height of 60-70cm and produces 425-475g/m² of tasty bud. She gets slightly taller in an outdoor environment with 70-100cm. Under natural sunlight, AK-47 Auto is able to reward the grower with 110-160g/plant. In the right hands, this cultivar is a great performer.